Food Supplement Ingredients Market size was over USD 700 million in 2017 and industry expects consumption at over 60 tons by 2024. Growing consumer consciousness towards nutritional enrichment among working professionals may drive food supplement ingredients market. Increasing prevalence of chronic diseases such as cardiovascular problems, diabetes and arthritis may further drive industry growth. Increasing muscle building trend and rising interests in athletics activities are projected to fuel demand in foreseeable timeframe. Food supplement ingredients such as vitamins, amino acid, omega-3, iron and folic acid are required to maintain body physique further enhancing overall health. Furthermore, increasing importance of these products owing to continuous marketing and advertisement by companies including Herbalife nutrition, Kemin health and Amway may boost overall industry growth. Global dietary supplements market size was valued at over USD 130 billion in 2017 and may project higher gains in the foreseeable timeframe. Vitamins based supplements are available in liquid form which are widely used owing to its nutritional source having minimal side-effects. Increasing application for sports related supplements and maintaining healthy bones & joints may drive the food supplement ingredients industry growth. Global sports nutritional supplements were accounted at over USD 40 billion in 2017 owing to growing demand by the athletes to improve their overall performance. These products are taken in the form of tablets, powders and liquid form to improve health, muscle growth and performance. Increasing number of health clubs which are marketing these products for weight loss & management may drive the food supplement ingredients market growth. Rising alertness towards cardiovascular diseases owing to change in diet patterns & lifestyle may boost importance for food supplement ingredients. Omega-3 can reduce the level of triglycerides up to 30% and improves blood pressure which may drive the demand for these products. Intake of these supplements may avert heart stroke and lowers the risk of heart diseases. Vitamins based food supplement ingredients valued at over USD 460 million in 2017. These products are essential for growth, health, vitality and prevention & cure of various health problems and diseases. Vitamins are vital for vision, normal cell reproduction and aid in production of red blood cells which is important for further growth and development, thereby increasing product demand. Probiotics based food supplement ingredients may register gains close to 5.5% by the end of foreseeable timeframe. These products boost the immune system and inhibit the growth of harmful bacteria. Probiotics avert the absorption of dietary fat in the intestine and aid in reducing belly fat, thereby increasing the product demand. 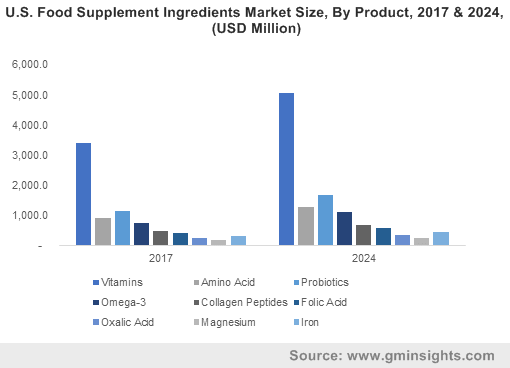 Collagen peptides-based food supplements ingredients was estimated at over USD 30 million in 2017. These supplements are soluble and easily digestible which are consumed to regularize joint functioning and enhances muscle growth. They are also used to strengthen gut and reduce gastrointestinal inflammation and aid digestion, thereby stimulating the product demand. Food supplement ingredients in powder form may witness significant gains at over 7% up to 2024. Powder form supplements are absorbed faster by human body and can be added to several drinks to make smoothies and healthy juices. These products can be consumed with milk products and offers various health benefits, thereby increasing the product market size. Food supplements ingredients in tablet form accounted at over USD 300 million in 2017. Tablets are considered as cost-effective supplements as compared to other product form counterparts. These products possess the ability to extend shelf life and retain potency over longer periods which may further stimulate the industry growth. Food supplements ingredients in gel form may witness significant gains at over 6.5% by 2024. These supplements are easy to swallow and are odourless which makes them easier for intake. Further, they also improve bioavailability by delivering the nutrient producing a quick action, thereby driving the product growth. Food supplement ingredients for infants was valued at over USD 45 million in 2017. Infant are provided with vitamin B12 further preventing anaemia along with supporting neurological function and are offered in liquid vitamin form. New born babies are supplemented with a dosage of vitamin D ranging from 8.5 to 10 micrograms until completing one year of age which may drive product growth. Food supplement ingredients for adults may register gains close to 7% by the end of foreseeable timeframe. Rising demand for nutritional supplements among sports persons and millennials may boost the product growth. Growing fitness trends and muscle building may require these supplements to enhance muscle growth and maintain overall health performance, thereby driving the market size. North America food supplement ingredients market size led by the U.S. and Canada may grow at over 6.5% by 2024. Increasing cardiovascular diseases in the region owing to shift in dietary patterns may drive the consumption of these supplements. These products aid in lowering triglyceride levels which may avert coronary heart diseases, thereby stimulating product demand in the region. Europe food supplement ingredients market led by Germany, UK and France was valued at over USD 175 million in 2017. Rising prevalence of disorders including diabetes, obesity and high blood pressure may rise demand for these nutritional supplements. Moreover, the European Commission has provided certain guidelines in order to avert consumers from various health hazards and directed a list of vitamins which are added to these products, thereby stimulating the regional industry growth. 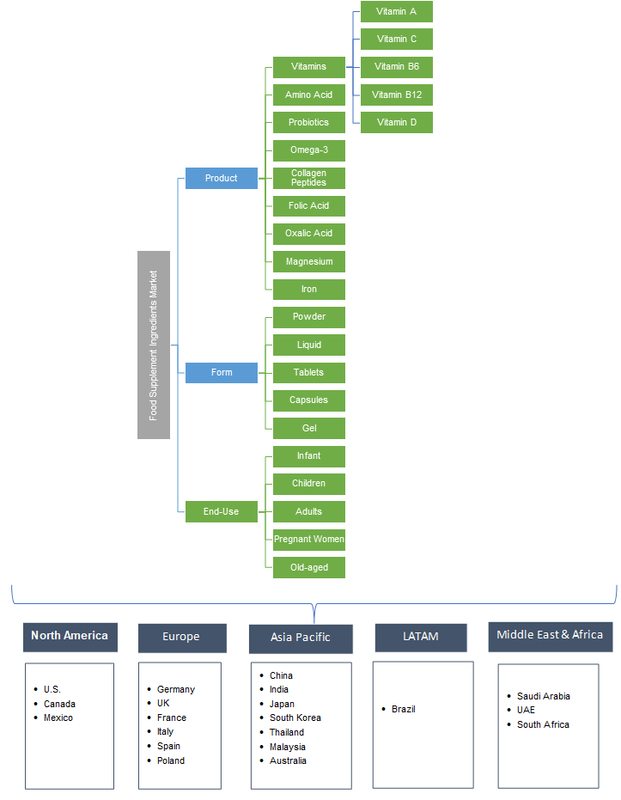 Asia Pacific food supplement ingredients market led by China, India and Japan may register significant gains at over 7% by 2024. Consumer awareness regarding the benefits of these products and wide product availability may drive the product growth. Increasing alertness towards personal healthcare and consumption of vitamin products may drive the regional industry growth. Global Food supplement ingredients market share is fragmented, and major operators include Amway, Capsugel, DSM, Merk CH and Kemin Health. The manufacturers are engaged in various strategic activities to expand their product portfolio. Furthermore, other industrial participants are concentrating to manufacture more lucrative products and strengthen the global presence. Food supplements ingredients comprises of various vitamins form including vitamin A, B12, C and D which are necessary to maintain overall health. Increasing obesity rates in various countries may boost the consumption of these products. Food Supplements ingredients comprises of various vitamins form including vitamin A, B12, C and D which are necessary to maintain overall health. Increasing obesity rates in various countries may boost the consumption of these products. Growing awareness regarding consumption of natural food products which contains various vitamins, minerals and lowers risk of cholesterol may drive the product growth.